Fining the perfect tri suit is one of the most essential purchases you will make when it comes to your triathlon activities. It is the one piece of gear you with have with you the entire time. You need to make sure you are comfortable, it fits properly, and there is nothing you will be adjusting or pulling at during your triathlon. TRIMS - Flatlock stitching throughout. 2 mesh pockets in the back. Flat and long drawstring for a custom fit. EXCEPTIONAL FUNCTIONALITY - Soft and effective leg grippers keep your shorts in place. Modesty panel for comfort and support. TRIMS - Flatlock stitching throughout. Adjustable zipper with zipper guard. Large armholes to prevent chafing. SUPERIOR FABRIC - Made from advanced semi-compression materials to help you perform at your peak. ✅ ATTENTION: PLEASE SEE THE SIZE CHART ON THE LEFT (IMAGES) FOR A PERFECT FIT - THESE SUITS RUN BIGGER THAN OTHER BRANDS! 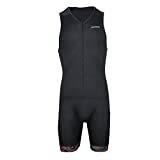 When searching for the best tri suit, it is often a personal decision. Every individual will have different preferences – some may love a certain material and others may dislike it. You may want to consider how much storage and pockets you need in your suit? How important are leg grips? Do you have easy access to the suit’s pockets? You should also consider what the temperature of the water would be like and the time of year your triathlon is – is it in the winter or summer? Will it be hot or cold outside? Below, we list and review five of the best tri suits for men currently available for sale online. Zoot has over 30 years of experience creating tri suits. This tri suit is designed with ULTRA Powertek with Coldblack. 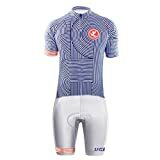 These unique technologies reflect UV light and heat so you do not have to worry about getting too hot in your suit even in the direct hot sunlight of the summer. The tri suit also features ULTRAcarbon, which is an anti-friction panel that minimizes any thigh rubbing and uncomfortable chaffing. Additionally, it helps reduce moisture and odors to keep your fresh and comfortable during your triathlon. 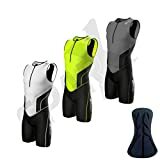 These handy panels also aid with muscle support to boost endurance levels and eliminate muscle vibration and injury. This suit also features SBR 2D pad construction and hip holsters and back pockets for nutrition storage that is easy to access. What makes this suit and company so great as well is that they offer a 1-year limited warranty on the suit. If there are any malfunctions or defects not caused by you, Zoot will replace your suit. ICE X Technology is used in this suit to keep you cool and comfortable throughout your race. The material is made from yarns woven with Xylitol to help keep the surface of the suit cool. The suit also has UV reflectors to prevent the material from absorbing any heat from the sun. Additionally, high filament yarns help to dry the suit material quickly and efficiently so you don’t have to worry about uncomfortable moisture buildup within the suit’s material. This race suit has all the bells and whistles you could ever want. Firstly, this suit has Fli-Fly – this is a hidden fly just above the pad that allows you to have quick and easy bathroom relief. The Clasico Integrated Pad has no stitching down the middle, is not bulky and uncomfortable, isn’t stiff, and stretched seamlessly in every direction. The seamless inner thighs also eliminate friction. Furthermore, Forza Compressor leg panels greatly reduce the possibility of delayed onset muscle fatigue and the Mobius Comfort Compression Band provides much-needed compression around the legs, but without tightness. Skin Cooler 90 is a fabric used in the upper body of the suit that keeps you cool and won’t make you overheat. This suit’s Liftfoil3 center panels help you to swim faster. Of course, your tri suit needs pockets so there are two Waterlid Pockets that are on each leg. The suit’s pockets are hydrodynamic when you are swimming and are perfect for storage during land exercises. Sun protection is important, so the suit has Shield Del Sol upper body to help protect you from the sun’s harmful rays. This special tri suit was developed with six-time Hawaii winner, Dave Scott. 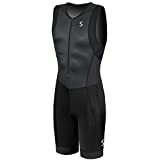 This tri suit is meant to provide you with ultimate speed, comfort, and breathability. It features Coldblack technology to keep you cool and is better than heat-resistance white fabric. This suit is a bit unique because it has a short sleeve design as opposed to the common tank top design. The short sleeve provides some extra coverage for those looking to not have their entire arm exposed. The front of the suit is fitted with a zipper for easily taking the suit on and off. Mesh panel along the spine and lower back help with heat dissipation and the silicone-free and leg openings increase you aerodynamics significantly. Castelli’s tri suit incorporates eight different kinds of fabrics to make up a two-piece suit, which is unique to all the one-piece options above. Some may prefer a two-piece over a one-piece, which makes this a great option. The chosen fabrics that make up this suit are water repellant and are tested in wind tunnels to ensure function and speed for the bike portion of a triathlon. This suite also provides a ton of muscle support to help support your body throughout the entire triathlon. Furthermore, their KISS anatomical seat pas in the suit provides ample padding, yet is not bulky or uncomfortable when running. This suit also offers UPF 16 protection – meaning 94% of the sun’s harmful UV rays are blocked by the suit (that’s 94%).